No, it’s not your imagination. Infographics are everywhere these days. Quite seriously, there is at least one blog that features infographics daily. Cheekily, here’s an infographic about the rise of infographics and a spoof post, just to prove how ubiquitous infographics have become. As Six Estate, we pride ourselves on our use of ethical journalism as a content marketing method. The content we produce on our clients’ behalf always is meant to satisfy two masters: first, journalistic integrity — i.e., content that presents a researched perspective — and second, content curation — i.e., selective news presented for the establishment of thought leadership, including inherent marketing purposes. Just a few years ago, it would appear that these missions would be at odds. Yet, as journalism evolves and marketing is increasingly value-focused, it seems convergence isn’t just inevitable, but also a powerful self-selecting method of information gathering. Infographics themselves represent these converging trends. Part of their appeal is the ability to offer a coveted at-a-glance understanding of complicated topics. They neatly compress data and drive clicks. Witness the startup Visual.ly, which fills the gap between withering full-time art departments in both newsrooms (journalism) and ad agencies (marketing), and adds consumer demand for new ways to explore and understand data. A poorly researched or executed infographic can be just as common as junk reporting or a badly written blog post. Data visualization is nothing new, but in recent years, this approach has gained significant traction as a tool used by marketers and journalists alike. There is significant criticism of the overuse of the tactic, and arguments abound that they are more about style than substance. 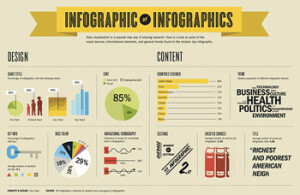 Are Infographics a Plus or Minus for Content Marketing? Surely, a researched and well-produced infographic is a definite plus to content marketing effort because it can be so enticing to share. However, quality matters. Best practice: Give your infographic the best chance of being seen and shared with a comprehensive social media/PR strategy. Don’t forget that infographics can also be used as a great internal communications tool, too. In summary: Infographics are a natural convergence along the evolution of journalism and content marketing, and, when crafted carefully, can be an excellent tool.